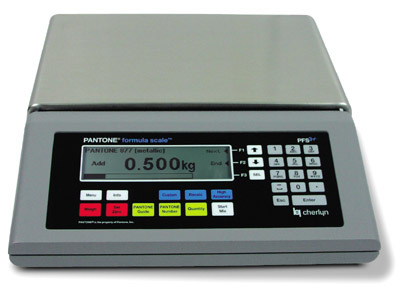 Like the standard PFS3 scales, it comes ready programmed with ALL the formulas contained in the standard PANTONE Formula Guide (including metallics & fluorescents), and the latest colours in both the PANTONE Metallic Formula Guide and the PANTONE Pastel Formula Guide. Now all PANTONE Formula Scale 3 Models are also programmed with the NEW PANTONE Goe™System Colour Range. These scales can be used to mix up ANY PANTONE solid colour. However, with this new model, you can store up to 100 of your own 'Custom' colours. So when you have a special colour for an important customer, you can save it in the scale memory, and you will know that you can easily mix the exact formula again when the customer comes back! The Custom Formulas can be derived from known PANTONE Colours by editing, or entered from new data. When saved, they can be named for easy reference.